Don’t imagine a yellow, puffy golden chick doing complicated equations (as awesome as that would be) as it would be far from the truth. However, the scientific fact is very interesting in itself as the little birds are able to do some adding and subtracting, in an animal version, of course. 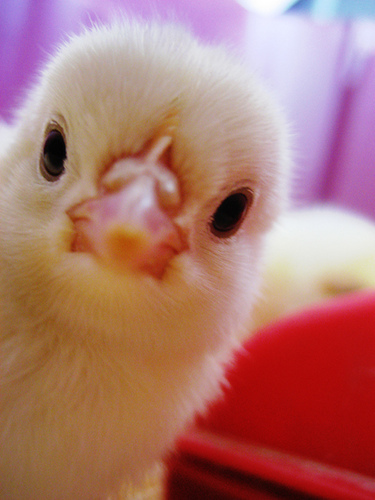 The experiment used on birds was similar to one in which human babies proved able to handle some simple problems. During the tests objects were added or taken away from a small pile which was behind a screen. The chicks proved that here is more about their species than previously thought, as they did a satisfactory job of keeping track of the object shifting, which represented problems such as 4-2=2 or 1+2 =3. The chicks were just a few days old and had never experienced anything similar. This was the first time young animals were tested. Until this experiment adult animals,including primates and dogs proved to possess the same skills. The fact that the chicks didn’t have the chance to learn too much before being tested proves that numerical understanding comprises a built-in system of unlearned knowledge. The scientists found themselves in the situation of having to create math tests for chickens, so they used their tendency to cluster; chicks who are alone tend to run to the biggest group around them. Little plastic balls or colored pieces of paper were put in the same cage with a recently-hatched chick, as the birds seem to treat them as companions. As predicted, the chick picked the largest group of objects. Chicks have also been able to make a distinction between the numbers 2 and 3, the second proving to be more “tempting”. When having to choose between three pieces of paper and the same area of paper which was separated into two parts, the first choice was preferred by most. But the most difficult test was yet to come: the chicks watched as objects were hidden behind two screens. Then the objects were moved from one pile to the other. In order to go to the biggest group, the chick had to keep track of addition and subtraction. And it worked in 3 quarters of the cases. If four balls were originally put behind one screen and two behind the other and 2 were taken from the first pile and put into the second, most chicks proved not to fall for the original number of balls and ran to the second screen. The study results are important as they prove that animals have a certain mathematical sense with no prior experience. This shows doing some kind of math is an inborn ability rather than being learned later in life.